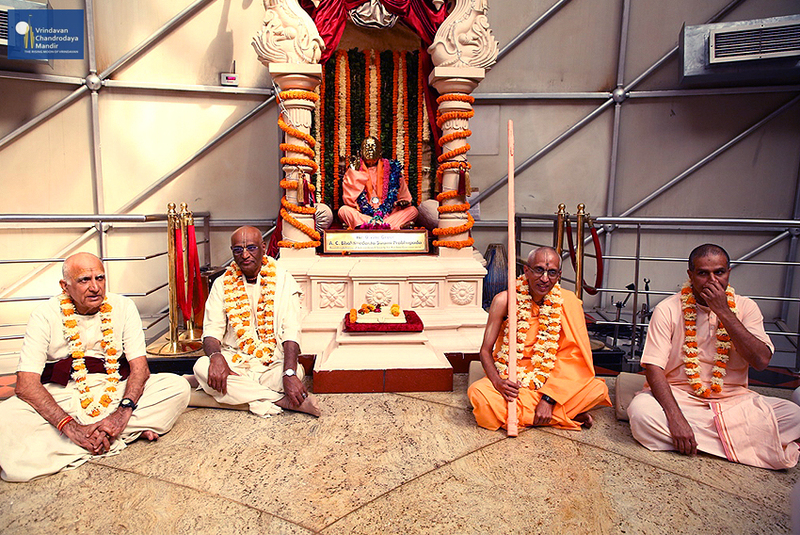 Vrindavan Chandrodaya Mandir celebrated the 41st disappearance of His Divine Grace A.C. Bhaktivedanta Swami Prabhupada on Sunday 11 Nov 2018 with solemnity and fervour. 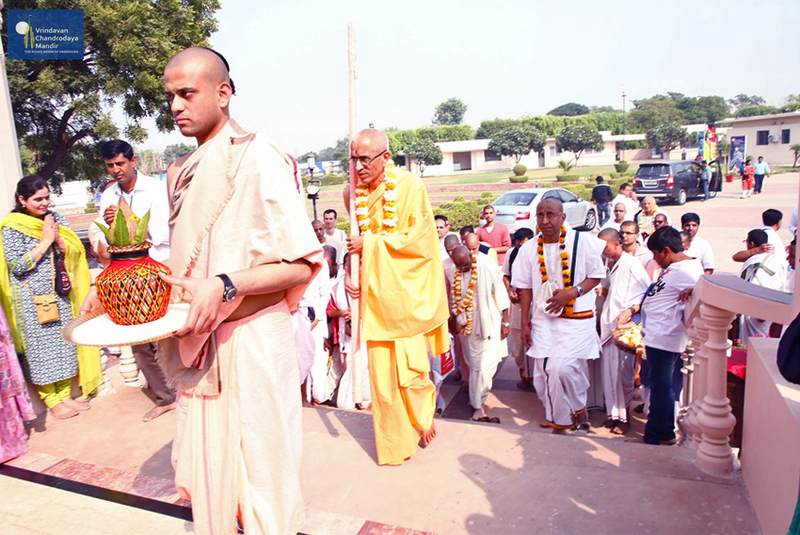 The morning program began at 11am with offering of Abhishek to Srila Prabhupada in the outdoor lawn. His grace Bharatharshabha Prabhu spoke about the significance of celebrating the disappearance day of Srila Prabhupada. On this solemn occasion His Grace Stoka Krishna Prabhu accepted the renounced order of Sannyasa and was received with ceremonial rituals at the temple after his sanyasi initiation. His Holiness Stoka Krishna Swami – his sanyasa name spoke to the devotees about this momentous occasion of ISKCON Bangalore. Then all the devotees were served lunch feast prasadam. 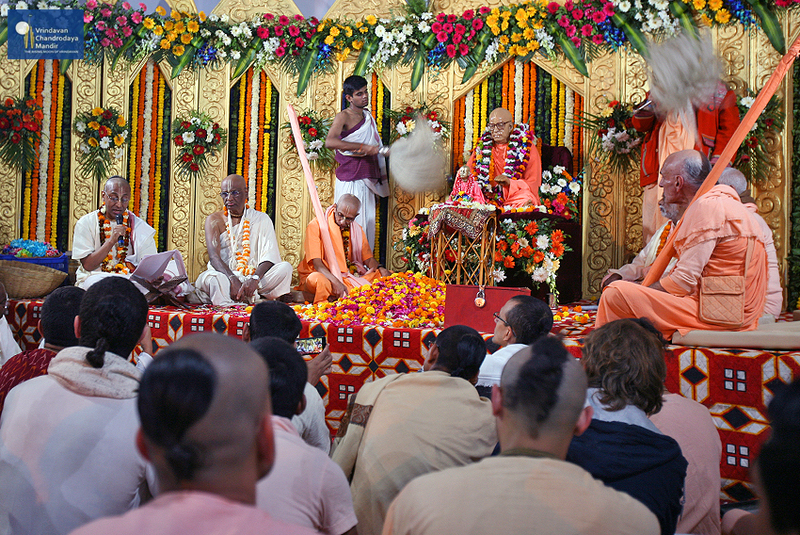 In the evening, Srila Prabhupada Smarana program was conducted at Sri Sri Radha Damodar temple where Srila Prabhupada had spent 6 years before leaving to United States. 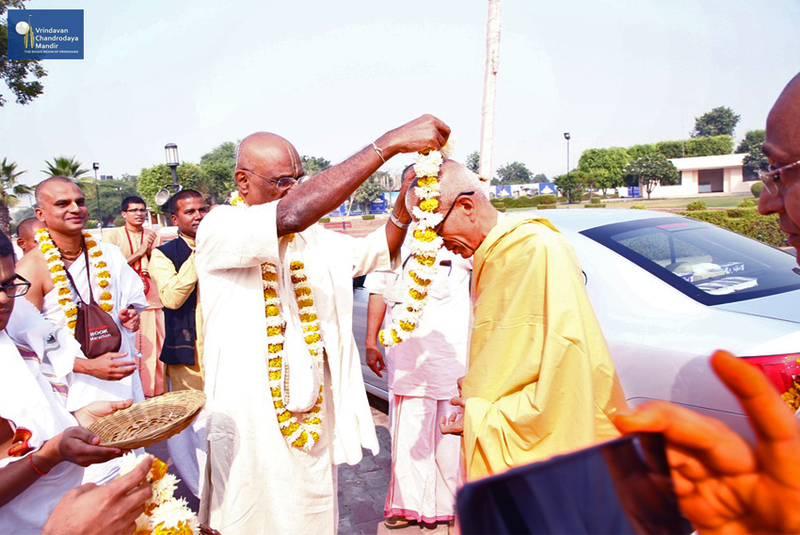 There are some senior devotees like Swami Paramadvaiti Maharaj graced the occasion in which His Grace Chanchalapathi Dasa President of Vrindavan Chandrodaya Mandir recounted departure pastimes of Srila Prabhupada, as narrated by senior devotees who witnessed them. 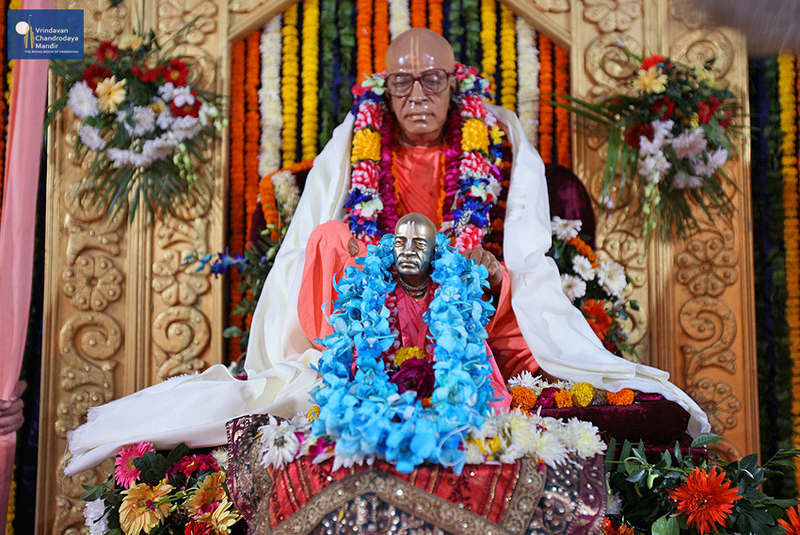 His grace Madhu Pandit Prabhu performed arathi for Srila Prabhupada. All the senior devotees shared their realizations about Srila Prabhupada’s great spiritual contribution to humanity. 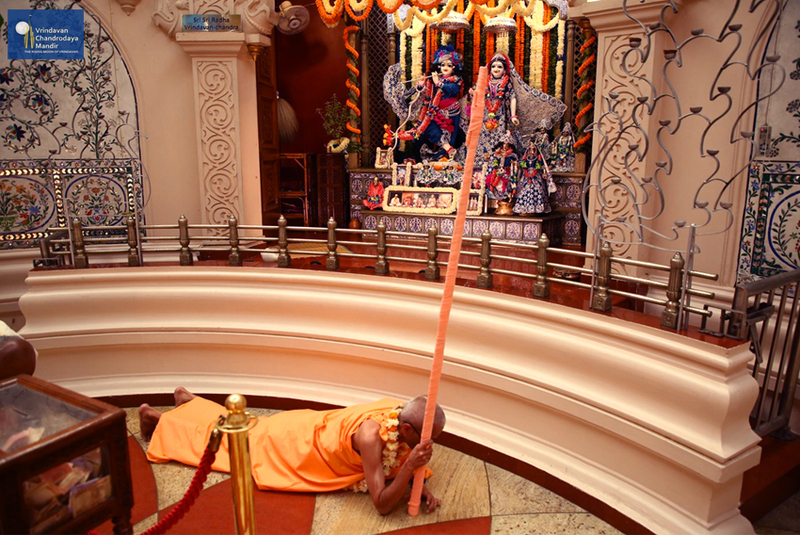 Then Srila Prabhupada was taken for darshan of the deities at Sri Sri Radha Damodar temple and all devotees performed Damodar arathi to the ecstatic sankirtan. At the conclusion all devotees were served dinner prasadam feast.